A week ago, Gabe Tuata was just another remarkable playmaker. One coach called the Kealakehe senior a younger version of Philadelphia Eagles star Brian Westbrook. Another said he was the next coming of Chad Owens. Still, he was just another Neighbor Island talent floating off the radar. That all changed last week, when Hawaii made the shifty running back a scholarship offer. Consider that UH hasn't recruited the Neighbor Islands heavily in the past, and that local receivers and backs rarely get scholarship offers, and it seems like a sea change is in effect. UH's offer means that schools like Boise State won't be keeping Tuata a secret of sorts. Boise State had been quite interested in Tuata since seeing him at the Just Win Camp last summer, according to Laau Tuata, Gabe's dad. The 5-foot-7, 170-pound Tuata added to his remarkable season by scoring three touchdowns in a 47-7 win over Keaau over the weekend. All the hyperbole and praise won't affect the standout back, not while dad provides protection. "He said, 'I'm gonna keep my options open,' " Laau Tuata said yesterday. Kealakehe, 11-0 overall and 9-0 in Big Island Interscholastic Federation play, is just one win away from capturing the league's Division I state tournament berth. "That's his goal, to play in (Aloha) Stadium," Laau Tuata said. "I just want him to focus on taking his team to states." Despite the win over Keaau, the Waveriders slipped a notch to No. 9 in today's Star-Bulletin Top 10. Mililani, with a stunning win over Farrington, leap-frogged into the poll and landed at No. 8. 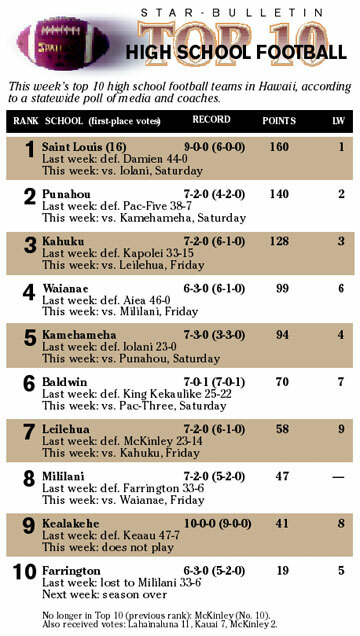 Kealakehe can't be blamed for feeling like an outcast, winning all 11 games thus far without a lot of statewide respect in the rankings. The Kona region has been a bastion of football talent for decades, but hasn't won a D-I state-tourney game yet.